Artists impression of the Bonham Quay development. More than 500 construction jobs will be created in the city centre next spring when work begins on the €100m Bonham Quay project. An Bord Pleanála this week approved plans by local developer Gerry Barrett to proceed with the substantial office development overlooking Galway docks. The complex will include four top-end office blocks extending to 26,000sq m (279,850 sq ft ) as well as 2,005sq m (21,581sq ft ) of retail space and accommodation for 350 students on Queen Street. The development is expected to attract considerable attention from UK-based companies who may wish to relocate to Ireland post-Brexit, and Patricia Staunton of agents Cushman & Wakefield has been engaged to handle the office lettings. Construction crews are expected to move onto the site just after Christmas to commence work on the development. In total, more than 3,000 jobs will be created in the construction and eventual occupation of the development and it could provide another boon to the city centre, as well as cleaning up an area of the docks that has lain idle since the oil storage tanks were removed from there a decade ago. Bonham Quay is expected to bolster Galway’s status as one of the fastest growing cities in Europe. The investment has the potential to create in excess of 500 full-time construction jobs, and it is anticipated that it will accelerate the delivery of urgently required prime office space, which will cater for approximately 2,600 employees once operational. Since its original announcement, the scheme has been revised substantially and can now fulfil a variety of uses. The 3,700 square metres of new public squares and plazas have been designed to be multifunctional and adaptable. They can be used for impromptu and organised events such as pop up markets, performances and outdoor cinema screenings. The most significant revision will be the provision of a larger dedicated arts/cultural facility. This multipurpose space will be a highly visible and flexible space for the use of corporate clients and the city of Galway alike. The space will be made available to local community partners and arts groups. A significant design feature will be the option to incorporation of sliding doors and walls which will open out and provide a significant connection with the docks and Galway Bay beyond. The scheme will build on the attractiveness of the city for foreign direct investment and the marked lack of Grade A office space, which is impacting its ability to grow, attract and retain sustainable business that would provide sustainable employment. The design of the development has been undertaken by BDP, a major international practice of architects, designers, engineers, and urbanists. It is expected to prove attractive to high-end tenants and will offer its occupants exceptional views across the city and across Galway Bay and will benefit from day-long sunlight. The granting of planning permission by An Bord Pleanala has been welcomed by Mayor Niall McNelis and the Galway City Business Association. Speaking following the news that the Bonham Quay development in Galway city centre, has been granted planning permission, president of Galway Chamber, Dave Hickey welcomed the news as "good for Galway." He said that the Bonham Quay development will provide space for around 3,000 jobs in Galway city centre and in so doing, will kick start the regeneration of Galway’s urban core. "Crucially, the development will also help satisfy the increased demand for accessible high-quality office space in the city centre," he said. "While we have lots of offices in the city, very few are vacant or of the size and quality needed by Irish or overseas companies for their staff. We know that Galway has lost potential overseas jobs to other cities because it hasn't office accommodation in the locations they want to be. Air BnB loved Galway as a place to live and work but couldn't find office space so they went elsewhere," he said. Mr Hickey added that the success of PorterShed, of which Galway Chamber is a founder, as well as the fact that MetLife, SmartBear, MathWorks, IPSwitch and Site Minder have all chosen city centre locations shows this demand exists. He said that Bonham Quay will help enormously in attracting further Foreign Direct Investment and allow existing companies to expand. The summer edition of Galway Chamber's Business Barometer — a survey of members carried out in June this year - showed that lack of high quality office accommodation is one of the significant barriers to growth for business at the moment. 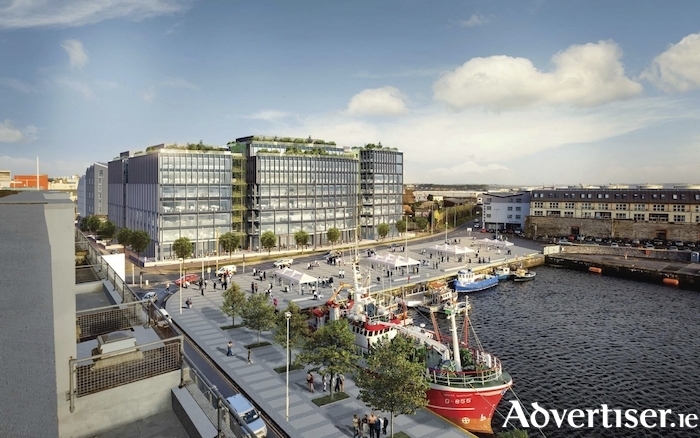 "The proposed Bonham Quay development, while filling a gap in the provision of city centre office accommodation, will continue the expansion of Galway as the economic hub of the west, not only benefitting the city, but also the region," Mr Hickey concluded.